We will be going out of town and I just found a perfect pair of slides to take with me- Adidas Adilette Comfort Slides in Raw Gold. 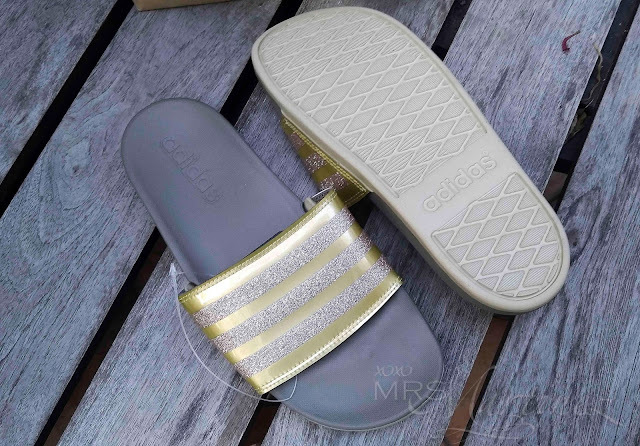 Some websites listed it under Adidas Women Swim as Adilette Cloudfoam Plus Explorer Slides. 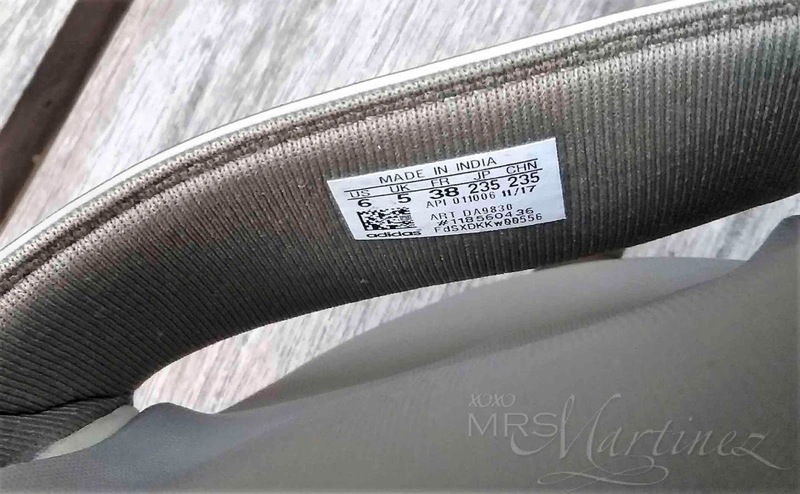 I have this to say--->it's the ultimate pair for walking because of its pillow-soft cushioning! 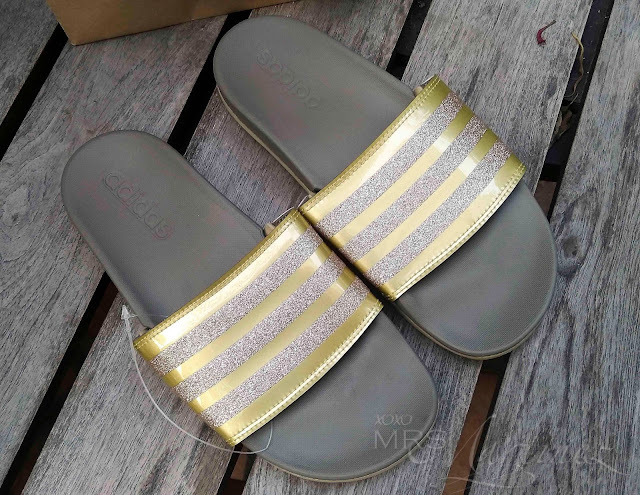 I was at Robinsons Magnolia Department Store earlier today when I chanced upon this sleek pair of comfortable slides in GOLD. I asked immediately if they have it in my size (US6/UK5) but the staff said none. I was about to settle with one size lower even if the fit was a bit snug when she offered to check if there's a new stock available. And lo and behold, she found one in my right size! 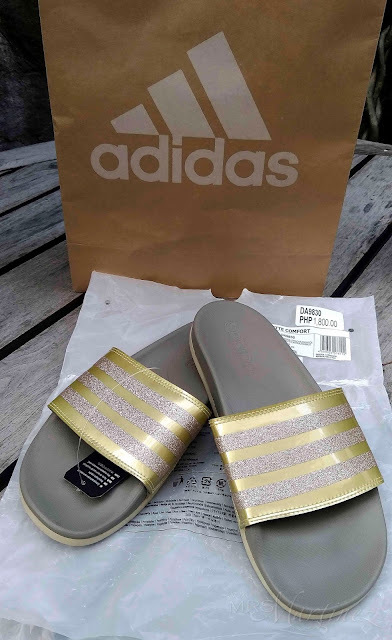 I decided to get it before someone else could grab it out of my hand for the second time 👅Last year, I was checking one of the Adidas stores when I saw a pair of Adidas Men Adilette CF + Explorer in Gray (Vista Grey). I know it's for Men but the staff was egging me to buy it as it was the last pair in my size. I decided to wait it out and not be an impulsive buyer that day. When I finally decided to buy it, every store I went to told me that it was already sold out. But I learned that good things happen to those who wait haha #patienceisavirtue Check out my new slides! 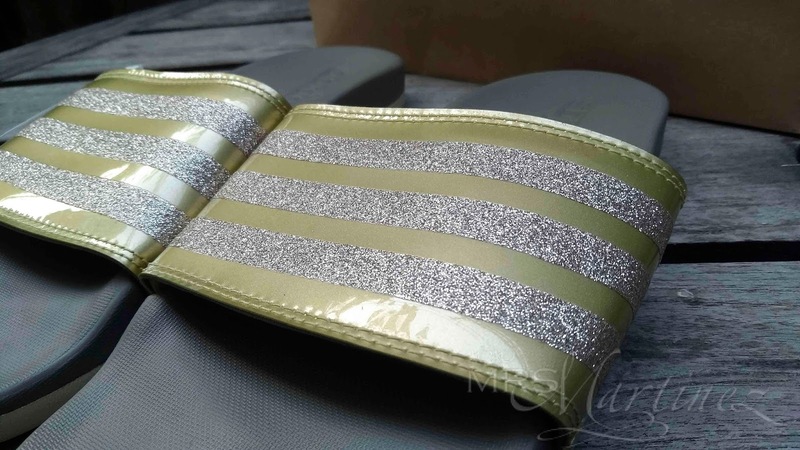 The single-bandage synthetic upper (strap) has double stitches on all sides with glittery 3-stripes on top for a glamorous touch. 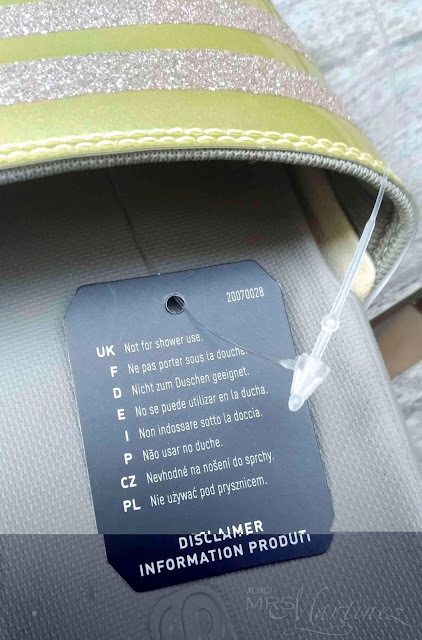 It has textile lining on the opposite side for comfort (see photo below). The tag features the country of origin, size, style (ART DA9830) and EAN PO # (ex. 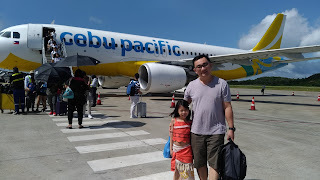 118560436). 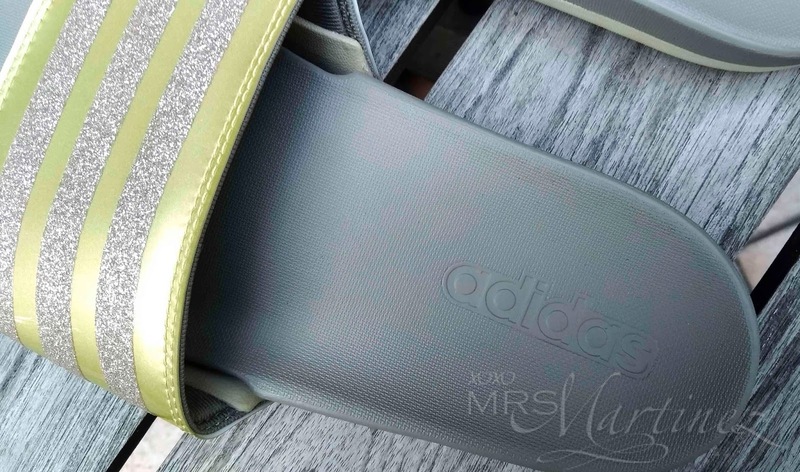 As with all Adidas, the left pair has a different serial number from the right pair. 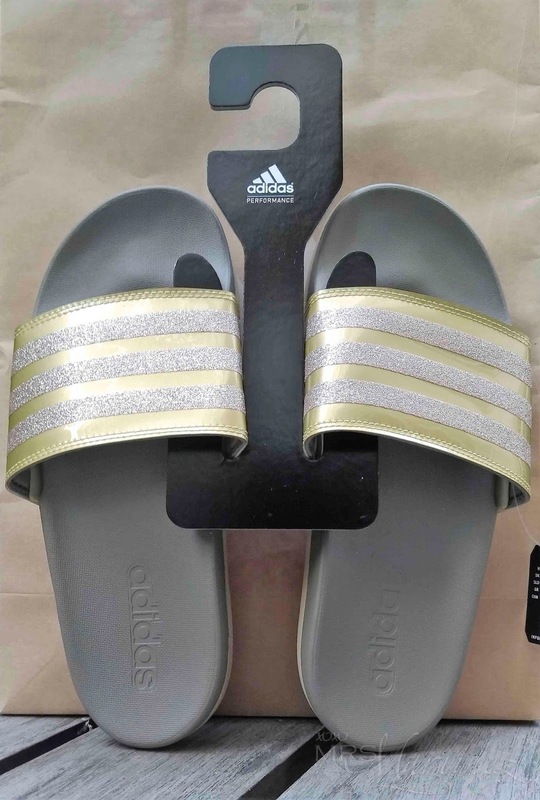 This pair of Adidas Adilette Comfort Slides comes in a plastic bag only. Along with it is a removable black tag (see second to the last photo) and a disposable hanger (see first photo). To complete my summer look, I also bought an Adidas Originals cap for Women 😘 While waiting for my blog post, please do check out my entry on Adidas Superstar Slip-On in Ortholite here. Or you can read my review on Nike Air Huarache Run Ultra here.